Nagy, Sue, Mills, Jane, Waters, Donna, and Birks, Melanie (2010) Using Research in Healthcare Practice. Lippincott, Williams and Wilkins, Broadway, NSW, Australia. 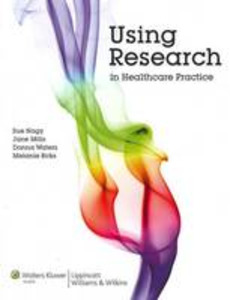 Using research in healthcare practice provides a comprehensive overview of the core topics required for an understanding of both qualitative and quantitative research. The primary focus is on encouraging students to understand the value of seeking out studies when they need to explore practice concerns or dilemmas. Unnecessary detail on 'how to' practice research is avoided, reflecting the level of detail required for undergraduate students to understand and utilize research. The text's health profession focus recognizes that the work of healthcare practice demands a rich, informed and complex knowledge base that is drawn on and added to by all the professional and consumer groups involved. When the focus shifts from 'discipline' to 'patient', research based understandings are more holistically patient and community centered, the central aim common to all professional healthcare practice. - developing techniques for the application of evidence to practice. * Examples of research from Australian, New Zealand and international sources are used to illustrate key points.